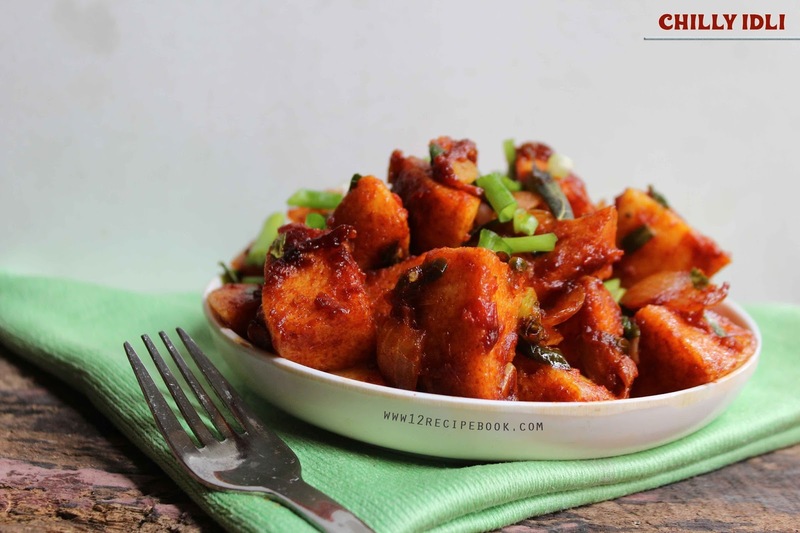 Chilly idli is an amazing combo of south Indian healthy breakfast idli combined with Chinese delicious chilli gravy. It is a useful way to consume leftover idli as a tea time snack. Childrens surely love to bite it. 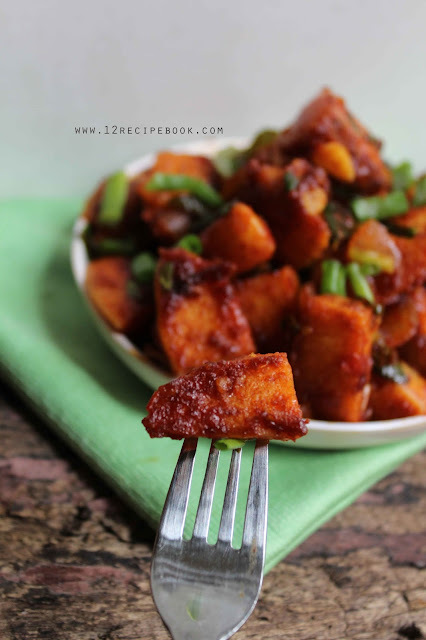 I already added one recipe with leftover idli in my blog in the past year.Check out Idli chaat. Blend the chopped tomatoes in to smooth puree in a blender without adding any water; keep aside. Mix cornflour with 1/4 cup of water and keep aside. Heat oil in a pan; add sugar; allow to browned the sugar. When it is browned in color add chopped ginger followed by garlic, green chilly and curry leaves. Saute for 1 minute until the raw smell goes off. Add cubed onion and saute for 2 minutes until transparent. Add kashmiri chilly powder and mix well. Add pureed tomato and salt; cook on low flame for about 5-6 minutes until the raw taste of tomatoes are gone and thickens. Add cornflour paste and mix well for a minute. Add cubed idli pieces; mix well. Cook until the idli pieces are well coated with the gravy (about 5-6 minutes) and dries out all the water content in it. Switch off the flame by sprinkling spring onion chopped. Serve hot and enjoy with a cup of tea! !